Warsaw, Poland (CNN) -- Poles are set to vote Sunday for a new president, following the death of President Lech Kaczinski in a plane crash in April. The election pits Kaczinski's twin brother Jaroslaw against Parliament Speaker Bronislaw Komorowski, who has been acting president since the crash. The two are among 10 candidates running in the election, which was originally planned for the autumn but brought forward after Kaczinski died. Jaroslaw Kaczinski, who was once prime minister, is a divisive figure in Polish politics. His far-right Law and Justice party runs on a nationalist platform with the slogan, "Poland comes first." "Poland has to be a strong country, otherwise it will not exist," he said recently. "I want to tell everyone here that as president I won't just be the head of state -- I will look after the strength of the Polish nation." 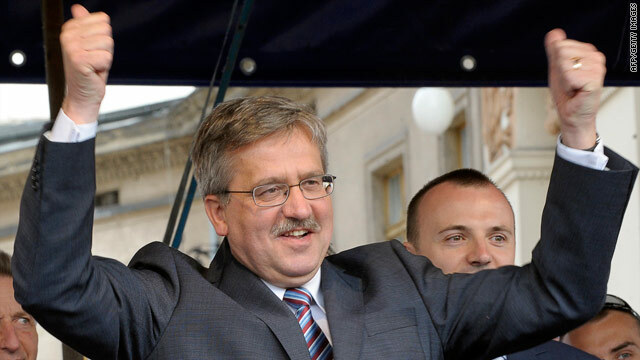 Recent polls show him trailing Komorowski, who is in the lead. The Parliament speaker is a moderate who is running for the center-right Civic Platform. "We have been on this road for 21 years together and we have been right," Komorowski said on the campaign trail. "We have been moving towards democracy and navigating our way in a free economy." The tragic death of the president and recent fatal floods in southern Poland -- which left at least 20 people dead and caused hundreds of millions of dollars in damage -- have meant this presidential campaign has been tame. Political analyst Radoslaw Markowski described the race as "less aggressive" and said the candidates have avoided straightforward debate. Though the president in Poland is primarily a ceremonial figure, he does have the power to veto laws, thus helping to shape politics. According to surveys, the economy is the most important topic to voters. Whoever wins must gain 50 percent of the vote, or else he faces a runoff later this summer.